Taking stock before Spurs’ daunting Rodeo Road Trip. 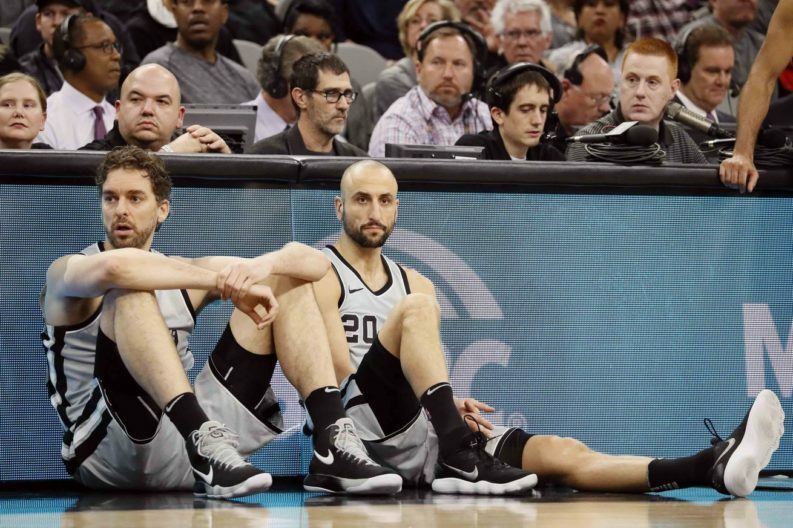 There’s good and bad news about an ailing Spurs team staring down one of the toughest remaining schedules in the league. First, the bad news. It’s been almost a decade since the prospect of winning at least 50 games in a season felt this uncertain for San Antonio. With the steady stream of injuries, the team now faces a daunting stretch of the schedule while leaning on a 40-year-old man as a top scoring option in crunch time. Following a 120-111 loss to Utah on Saturday night, the Spurs limp into one of the most challenging Rodeo Road Trips in recent years—one that features the always-hospitable Golden State Warriors and a Jazz club playing like a team possessed. Even though Manu Ginobili is scoring in the clutch like he plans on staying in the NBA another 11 years, LaMarcus Aldridge needs more help on offense. The immediate outlook is bleak, and the Spurs will have to shore up their defense if they want to have any chance at staying in the top four in the Western Conference. The fight for 50 wins will be tense; They can only lose 11 more games. But as always, the long-term implications bode well for a team that still doesn’t know its own identity. The Spurs’ role players have been asked to do more than they’re comfortable with nearly all season. Davis Bertans, Bryn Forbes and Kyle Anderson have visibly improved in Kawhi’s absence. And all three players have put up stunning numbers at least once this season. After Kawhi returns from his injury and gels with the team — hopefully before the sun goes supernova — he will have a much stronger and more capable shooting core around him than last year. Kawhi’s re-integration will throw everything out of a whack for a while, but the young guys will have a little more hair on their chest when it happens. Bryn has become something of a break-glass-in-case-of-emergency resource on offense. He has the second highest 3-point field goal percentage on the team at 41.2 and the highest among Spurs with at least 3 attempts per game. His ability to finish in the lane, coupled with steady improvement on defense, earns him about 20 minutes a game. Kyle is in the middle of a borderline dominant stretch for a player who looks as if he moves like Gumby come to life. His individual offensive rating (113) is second only to LaMarcus Aldridge, and he has the best field goal percentage on the team at 51.7. Defensively, he’s a little better. He allows the second-fewest points among active Spurs (101), and he leads all active players in steals. Davis, who started in place of Pau Gasol on Saturday, is a master of abating an opponent’s momentum with a timely 3. With the highest effective field goal percentage on the team, he’s just as devastating from 24 feet as he is from 30 feet. How Pop uses him when Kawhi returns is one of many things he’ll have to figure out on the fly. It’s hard not to daydream about what the team will look like when it doesn’t have to rely on role players for consistent offensive production. But we should take heart in the strides these three players have made under difficult circumstances. Winning less than 50 games for the first time since 1999 wouldn’t be a travesty. It’s a bummer at most. All signs point to the Spurs in the playoffs for the 21st consecutive season. At the end of the day, the 50-win minimum is just a novel way to say the team has been quite good for a very long time. In the perpetual search for an offensive spark, Pop gave Darren Hilliard some meaningful minutes for the second straight game. He called the Villanova grad “feisty” before the matchup against Utah. Brandon Paul has virtually disappeared from the rotation since the start of the season. He played at least 10 minutes in 15 of his first 30 games. But in his last 18 games, he’s played at least 10 minutes only five times. He also hasn’t played more than eight minutes since Jan. 11. What are they putting in that grandpa juice ? Manu Ginobili is literally the second-most effective shot creator among active Spurs right now — in 2018. He was also the second-most effective shot creator on the Spurs when I was a small child – in 2005. I can’t express how much I will miss that man if he ever retires.